Name of Book: I Like Myself! Audience: This book is intended for children of preschool ages, but can certainly be appreciated by people of ALL ages. Summary: A little girl embraces exactly who she was created to be…..herself! Literary elements at work in the story: I Like Myself! is a wonderfully illustrated and humorous narrative that shows a little girl identifying all the things she likes best about herself. More importantly, and most entertaining, is the way she describes how much she would like herself if she were to turn into a horned and spiked monster, because she also likes who she is on the inside. How does the perspective on gender/race/culture/economic stability make a difference to the story? 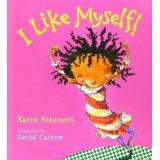 Karen Beaumont and the wonderful illustrator, David Catrow, have centered this book around an adorable, spunky, fearless and imaginative African-American girl. Although the color of her skin is never mentioned, it is a gentle reminder that people of all cultures and colors should celebrate our differences and our individual beauty that cannot be defined by anyone other than God. When you look in the mirror or when you look deep inside yourself, do you think that you love yourself as much as the little girl in this book loves herself? Do you find that you compare yourself to others and come up short in any given area? How do you think God would feel about our comparing ourselves to others? Has there been an experience in your life that caused you to believe that you were not perfectly and intentionally knit together by God? Was it something that was done to you by another that made you feel you were not good/beautiful/intelligent, etc. enough? Is there a mistake or sin in your past that you feel has covered your inner or outer beauty and/or diminished your beauty in God’s eyes? What are ways to being embracing the gifts of personality, appearance, and individuality that God gave each of us? What can we do to stop comparing ourselves to others or wishing that their gifts were our gifts? I Like Myself by Storypath is licensed under a Creative Commons Attribution-NonCommercial 4.0 International License.